The decennial census anchored our early explorations into Northlake's shifting demographic context. Comparing the three census tracts that comprised the Northlake Study Area with the rest of the city, it became apparent that the demographic context had shifted along with the region while diverging in a few important respects. What had been a decidedly middle class neighborhood in the mid-century, with little divergence between the three census tracts and a median income roughly on par with the city average - had, by 2010, begun to diverge. The student population exploded and brought down the median income in the tract nearest the university, while the single-family housing of the middle tract attracted an increasingly wealthy populace. Educational attainment throughout the region increased substantially from the mid-century to 2010. Whereas a high school degree was a relatively lofty accomplishment in 1950, by 2010 a Bachelor's degree was required to keep pace with the city norm. For this reason, comparing Bachelor's attainment in the 21st century with high school degrees in the 1950s is appropriate. 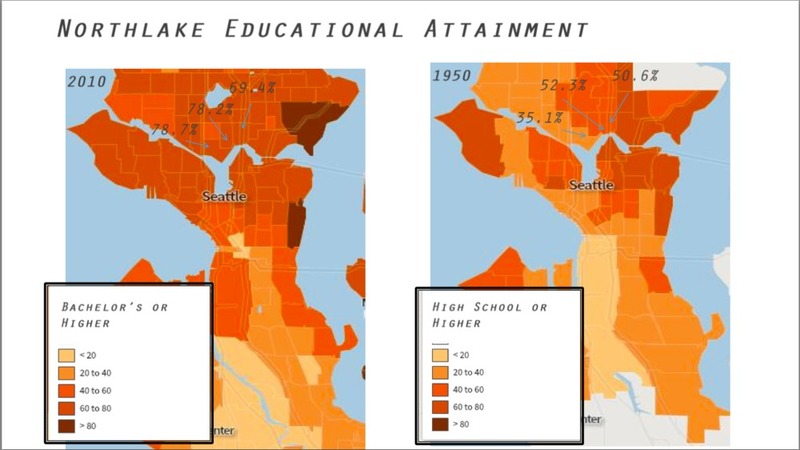 Additionally, whereas the pattern of educational attainment in the 1950s displayed a distinct striation, with dividing lines roughly tracking the three census tracts of northlake, that pattern had dispersed by 2010. The current northlake neighborhood is nearly uniform in educational attainment, and roughly on par with the city average. One striking divergence in the northlake area was in the percentage of foreign born residents. Firstly, the percentage of foreign born residents decreased in each of the three census tracts. Secondly, and most importantly, however, this change was at odds with the regional trend as a whole. 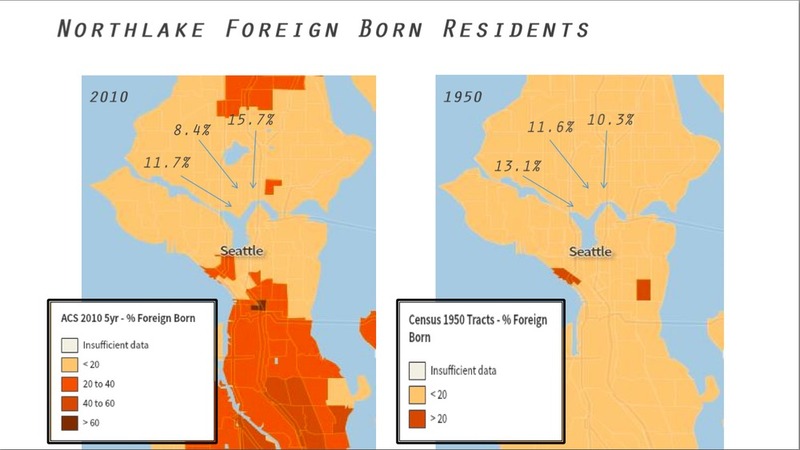 The city dramatically increased in percentage of foreign born residents while northlake stalled.